This hat is very cool! Maybe it's because I'm as old as Brett Favre, but I'm not a big fan of the flashy, loud hat with the flat brim. Ah, but this simple, solid colored Ashworth hat is right up my alley. Of course, when I think of Ashworth I think of another old guy, PGA Tour Pro Fred Couples. The man is the epitome of understated and non-flashy. This guy has always been a fan favorite because of his long, looping fluid swing and his laid back, "just another walk in the park" attitude. Fred is still going strong. 2010 is his first year on the Champions tour (and he's still one of the longest hitters on the PGA Tour). And Ashworth is still just as popular, now sponsoring Stuart Appleby, Chris DiMarco, Rich Beem, Jim Nantz, Rick Smith, Nick Watney, and Steve Flesch. 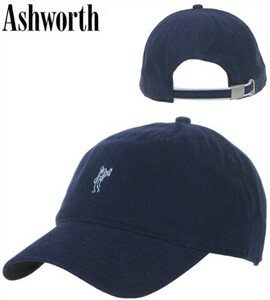 This hat is a simple solid color with Ashworth's well-known Golfman logo on the front. It comes in white, tan, black, and navy blue. I like the navy blue the best. The hat fits all sizes with the adjustable two-toned colored strap with a silver clasp. The underside of the hat is dark to reduce glare. The hat is made with 100% cotton twill, which is fairly light and breathable. For a hat that is better for wearing on those hot muggy days, check out the Nike Feather Light Cap. This hat is incredibly lightweight and wicks sweat away from your head.